C’mon, Who Really Wrote it? : James Beuchler in 1961. One of two originals in a row he would write, but we’ve seen Mr. Beuchler’s work before in 11: WHILE THE CLOCK TICKED and in 14: THE HIDDEN HARBOR MYSTERY, both of which he revised in the same years as he was writing his two originals. I gave #11 a rating of 8 and #14 a rating of 6. Hmm..do I smell a 7 coming on here? Cover: Rudy Nappi. Couldn’t be more classic. 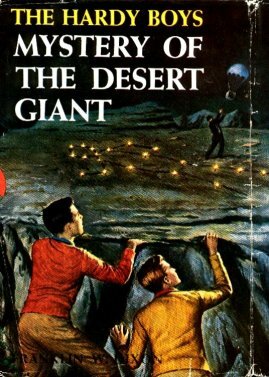 Frank is wearing red, Joe is wearing yellow, they are staring at a bad guy caught in the act, this scene comes right out of the book in the way the covers often give the ending away, and it’s at night. My only quibble? The giant depicted is far too small. In the book it’s geographically accurate, but I guess Mr. Nappi had to compromise or else we’d have no idea what we’re looking at. Setting: Bayport, the California desert and Mexico. Where’s Fenton This Time? : He shows up, and is one of the gang this time. Which Chums Show Up? : Chet. Aunt Gertrude’s Dessert: None. At one point the boys revive a conked Chet by telling him Aunt Gertrude made a chocolate cake. But she didn’t. Now that’s just cruel! Plot: This is a missing person’s story. Someone goes missing, the boys go out west to find him. There is a gang doing some criminal stuff that the missing person got caught up in. That’s about it. Review: This is another Hardy Boys Go West story, but I give Mr. Beuchler credit for adding more realism to the characters. When they finally find the missing person, he doesn’t want to be found, and he has valid psychological reasons for thinking this. I pointed out how intense 11: WHILE THE CLOCK TICKED is, with perhaps the most dire ending situation of any Hardy Boys book. Well, he likes writing interesting psychological personalities, and I give him credit. I also like that the crime in this story is not the usual jewel thieves or the like, but a more realistic type of crime. We are getting into modern behavior now. I think we can all say Amen to that.